When I was a kid, my school reports always stated that I was bright but just enjoyed talking in class too much. I guess that’s why I ended up being a salesman. I love nothing more than to tell people all about a product, and I like it even better when they walk away with something I know will do the job they want it to. My main area of expertise is kitchens and everything that goes in them. I could get involved in organizing all the items needed for a refit or brand new kitchen, or I might just sell the odd appliance here and there. Just lately I decided it would be a good idea to pass some of my knowledge about the faucets you can find on the market. I chose faucets because they’re not generally a huge purchase and most of them don’t need a plumber for installation. I also happen to think that people don’t pay as much attention to this “tool” in the kitchen as they should. After all, a sink won’t do the job it’s supposed to unless you have a faucet now will it? 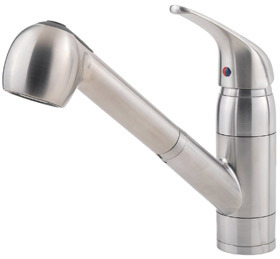 You will find a number of different reviews on my site on all types of faucet, but for this particular page you’re going to learn about the Pfister G133-10SS which is a single handle model with pull-out spray. I have to say, it doesn’t matter if I’m dealing with a man or woman the first thing everyone looks for in a faucet is design, and this one won’t let you down. Sure, it hasn’t got any fancy frills but once it’s installed it will add a certain something to any sink. One of the best features the manufacturer has included is color. You’re not limited to a standard stainless steel. In fact you can choose from polished chrome, pure white and a very fancy looking Tuscan Bronze as well as stainless steel. 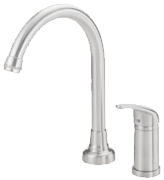 Next on the list after looks is always what you can expect to get from a faucet, and again this one won’t disappoint. It only has one handle with a 360 degree swivel spout which makes for more versatile operation. It also means (unlike many other appliances) that it doesn’t matter if you’re left or right handed this faucet is just as easy to use. The pull out spray is really handy for rinsing out your sink where standard faucets can’t reach and perfect for cleaning off vegetables or filling large pots with water. Although, I have had comments that this hose is made of a braid type material so you have to be careful you don’t get kinks in it. Pfister has made sure this model of faucet is ADA approved, and the disc valve is ceramic so you don’t get problems with leaks. It’s also pretty simple to install as long as you follow the instructions included. For those of you that don’t know one end of a wrench from the other, perhaps it would be a good idea to call your plumber. I think this faucet is very reasonably priced, looks good without taking over the décor in your kitchen and because it’s backed by a lifetime guarantee, you have peace of mind it’s been built to last. If you want to find out more, take a little look at Amazon where you will find plenty of very happy customers and some fantastic deals on price.